It’s Tuesday and as I looked around it seems that almost every book blogger has participated in Top Ten Tuesday, so I will too. Top Ten Tuesday is a meme hosted by The Broke and the Bookish. This week’s topic is: Books I Want To ReRead. A Great and Terrible Beauty by Libba Bray — I remember reading this book like it was yesterday, but sadly I do not remember the other two books in the trilogy. I would love to spark my interest in this series by rereading the first one again. Allegiant by Veronica Roth — This book was awful. I hated it. I may be part of the few or part of the many, but it was not one that I liked. (I could go on a really long rant), but with the movie coming out in a couple years, I figure I might as well refresh my memory and see if my view on the ending to the amazing beginning has changed. Harry Potter (all of them!) by J.K. Rowling — Harry Potter means so much to me. I will be forever in love with this series and all that it brought to me when I was younger and that it continues to bring to me today. For being such an obsessed child, I have never reread the Harry Potter series *gasp* but I have wanted to for awhile. Mockingjay by Suzanne Collins — For the same reason that Mockingjay is on this list, I really didn’t like how The Hunger Games trilogy ended and kind of despise the last book, but with the movie coming out soon, I feel a refresher will be needed. The Catcher in the Rye by J.D. Salinger — Good ole classic that was a high school required reading. I feel like they ruin the best books this way. I didn’t like this book, because I was forced to read it, but I feel like if I was to give it another shot on my own terms, I could possibly like it. The Clique by Lisi Harrison — Yes. I did put this on here. By no means do I want to reread the entire series (I never made it past book 5 the first time), but I just remember them being such a huge sensation during my Elementary and Junior High years and it is so small it would take about an hour to reread. I would just love to relive all the hype for just a moment. The Pact by Jodi Picoult — I am an avid Picoult reader and huge fan. I have not read very many of them more than once, but I feel like to really process all of the information they need to be read twice. This was one of the first Picoult novels I read and that was years ago and I have been itching to read it again and see what perspective I latch onto this time. The Perks of Being a Wallflower by Stephen Chbosky — I read the book awhile ago and had mixed feelings about it. Now that the movie has been released and I enjoyed it and I may consider giving the book a second try. The Truth about Forever by Sarah Dessen — Sarah Dessen novels have a special place in my heart. 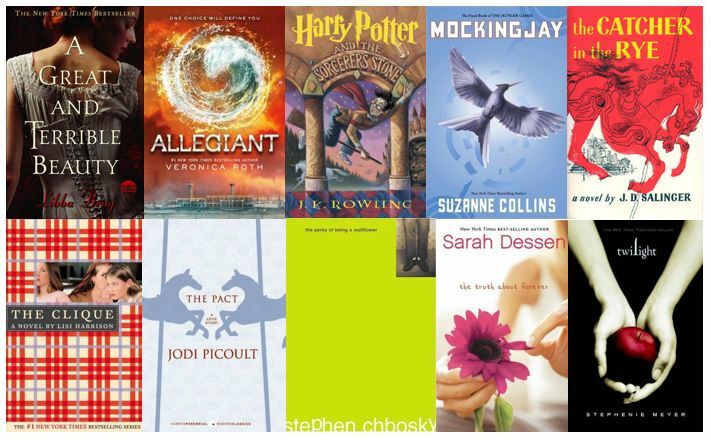 I read them on the weekly basis back in my early years of high school and part of me is still attached to them. This one was always my favorite and I would love to revisit it. Twilight by Stephanie Meyer — Yep I did it and I have NO shame. I was completely against Twilight when it first became a big thing in my Junior High, but because of unforeseen circumstances I ended up reading it and loving it. Now that the hype has gone down I would love to them again… if not all, at least the first.